Never before has such a thing been invented! Digital nail printer! Do you know how digital patterns are generated? Admittedly, we do not need as many nail polishes as we would use for classic manicure yet we have to prepare a nail polish primer and a top coat. How are digital patterns created on fingernails? 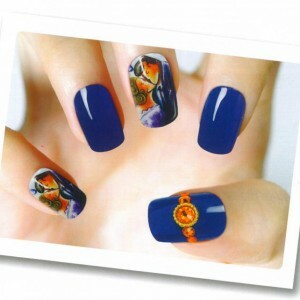 The first stages of this kind of manicure are well-know to all of us. At the beginning, a beautician disinfects customer’s hands, degreases fingernail plates and dries they out. After that, she uses an emery board to file the nails in order to obtain rough surface. The consequence of such a procedure is better and faster absorption of a nail polish. Then, the beautician removes the dust from nail plates using a brush or a soft cloth. Now, she can apply a nail polish primer that is hardened thanks to LED lamps (the hardening stage lasts approximately 30 seconds). When the first coat is dry, another coat of the nail polish can follow. It is worth mentioning, the brighter the nail polish is, the more visible printed patterns will be achieved. Again, this coat has to be hardened under LED lamps. Now, the beautician applies another layer of the nail polish primer and hardens it using LED lamps. Time for preparing fingernails for printing. The beautician begins with covering fingernail plates with a special transparent varnish. However, she does not cover the entire fingernail – she leaves 1 or 2-millimeter gaps from each side. Thanks to this, it will be easier to clean fingers when this beautifying treatment is over. The varnish has to dry for several minutes. After that, the beautician applies nail manicure protective stripes. Now, we can choose the pattern, that is going to decorate out fingernails. These are displayed on the printer’s screen. Then, we put either a finger or fingers inside the printer (it depends on the type of the device). Then, the beautician sets a particular pattern to a fingernail and adjusts its position. Finally, she can press the ‘print’ button. When the patterns are printed on the fingernails, they have to be safeguarded against flecking and wearing off. The beautician takes out the nail manicure protective stripes and cleans edges of the fingernails with a nail polish remover. After that, the printed patterns are dried and covered with a coat of the nail polish primer that is, obviously, hardened under LED lamps afterwards. Later, the beautician files edges of the fingernails in order to remove excess of the nail polish and ink. In general, the edge of a fingernail has to be filed evenly to block water or contaminates from penetrating under the printed pattern. And again, another layer of the nail polish primer is applied and hardened later on. At the end, the beautician applies the top coat that has to be hardened for approximately one minute. Digital pattern on fingernails is now ready!